Even then, the issue did not disappear in some voters’ minds. 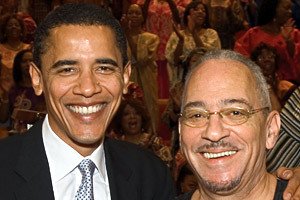 An Oct. 14 CBS News/New York Times poll released three weeks before Election Day found 11% of voters were bothered by Obama’s past associations with Wright. Both Brickner and Muthee were the subject of news reports in Politico, the AOL news website, The Atlantic and MSNBC’s Countdown with Keith Olbermann. A headline about the Muthee incident, which sensationalized the figure by calling him a “witch hunter” – Muthee had prayed for Palin to be protected from “every form of witchcraft” – remained on the Drudge Report’s website for days. The New York Times ran a front-page story on June 9 that focused on McCain’s efforts to woo religious conservatives but reported that some of these groups were wary of McCain given the way he distanced himself from Hagee. On May 23, a panel on CNN’s Anderson Cooper 360° discussed the idea that the incident may have helped Obama with religious voters and may have hurt McCain. A local bishop from Biden’s hometown in Delaware, W. Francis Malooly of the Diocese of Wilmington, did not sign the Sept. 9 statement. But he wrote a public letter published in The [Wilmington] News Journal on Oct. 26 in response to a comment about abortion Biden made in an Oct. 19 interview. Malooly wrote that Biden presented “a seriously erroneous picture of Catholic teaching on abortion” when he said that the Catholic Church has “ ‘wrestled with this for 2,000 years,’ ” and when he “claimed repeatedly that the Church has a nuanced view of the subject that leaves a great deal of room for uncertainty and debate.” The bishop called these assertions “simply incorrect,” saying, “The teaching of the Church is clear and not open to debate.” The Delaware bishop’s letter received little national coverage.